Land near Phoenix Golf Course. An excellent opportunity for a ready to build land parcel, in a popular residential location with easy access to the beautiful beaches of Bang Saray, Ocean Marina Yacht Club, the new Cartoon Network waterpark, and Pattaya City. With the land filled this saves a huge amount of money, plus if necessary, any buyer could choose to cut the land into individual parcels, and sell what is not needed. 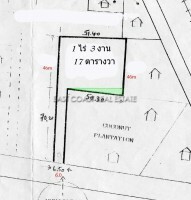 This land parcel is held in Thai name ownership, with the seller also agreeing to split any costs for transfers 50/50 with the new buyer. There are other smaller plots in the area, but the asking price per Rai is far higher at well over 6,000,000 Baht, so this is an excellent opportunity.